Westside Story – A What If Tale? My sister, Peg, and I traveled from Sea-Tac Airport in separate airplanes to reach the Montreat Conference Center, about 2,778 miles southeast of Lakewood, Washington near Asheville, North Carolina. The two of us met up to attend a 5 day Road Scholar photography class. 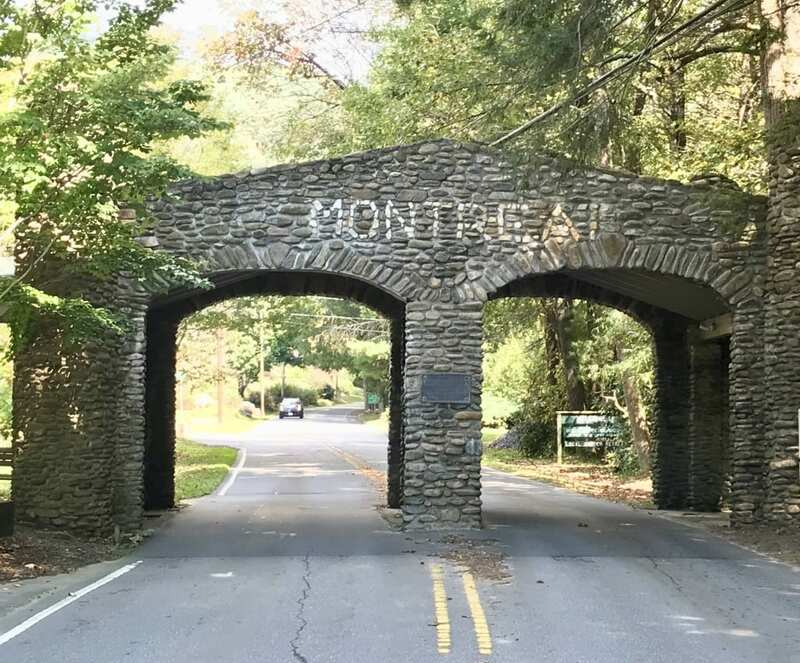 Entrance to Montreat College and Montreat Conference Center. About three days into the class, Peg and I were hanging out at the Huckleberry Coffee Shop enjoying an espresso beverage next to Lake Susan and the beautiful spillway. Peg left the Huckleberry about a half hour before me. I stayed behind working on another Westside Story. I arbitrarily selected one of the several routes back to the Montreat Inn where we were both staying. My chosen pathway turned out to be what I term a coincidental and fortuitous route. 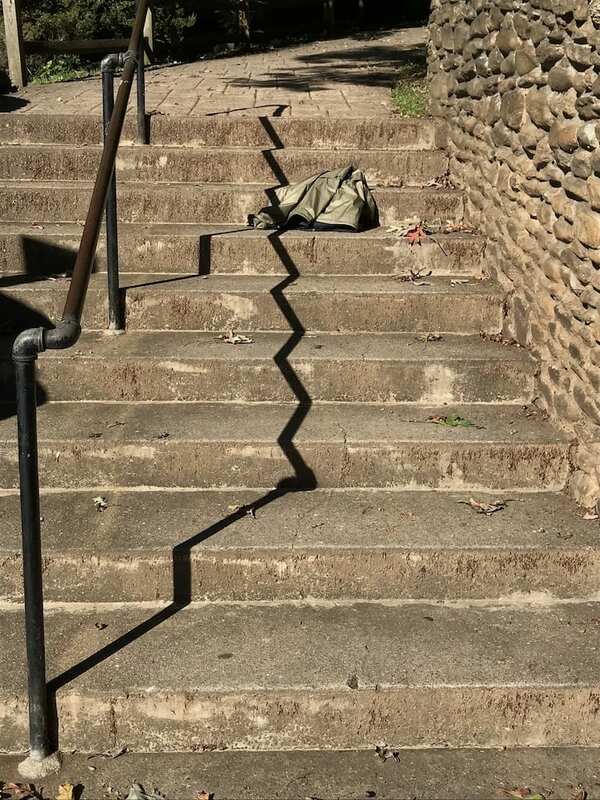 As I approached the first bank of stairs two distinct black shadow lines produced by the sun backlighting the handrail in the middle of the stairwell led my eye to a garment laying on the stairs. The right side of the clothing item was framed with a red leaf. The focal point for my eyes was the garment. Two shadow lines lead my eye to a woman’s lost coat. When I saw the garment, my retired deputy sheriff brain went into gear. While any good deputy is trained to protect and serve, deputies are often presented with a confusing array of options concerning alternative actions they might choose from to solve a problem. OPTION 1: Not touching and leaving the obviously expensive ladies garment is a good option in case the owner discovers her loss and backtracks her route to recover her lost jacket all on her own. OPTION 2: Picking up the garment and checking for some form of ID could be helpful. If the owner could be identified in this manner, then a little more investigation at the retreat center’s front desk could create an opportunity for some lost and found communication. OPTION 3: Picking up the garment and transporting it to the lost and found at the front desk of the retreat center would protect the clothing from rain and theft. I decided on option 2 and 3. My normal tactical thinking mode is to favor taking a chance on failing after selecting any and all action(s) I deem prudent, rather than failing because I took no action. I picked up the jacket and checked it for owner identification. There was none. I carried the jacket back to the retreat center which is much like a hotel with a giant dining room for the retreat center guests. As I entered through the side door to the lobby and approached the front desk, I noticed my sister, Peg, waiting her turn to talk with the front desk clerk. I looked at Peg. Peg looked at me. Without missing a beat, Peg asked, “Joe, where did you find my jacket? I did not even know I had lost it.” To escape the heat, Peg had tied her jacket around her waist. I had not recognized the coat as hers. 1082 students attend nearby Montreat College which shares its location with the Montreat Conference Center. There may be at least another 400 people staying at the Montreat Conference Center. Then there are 783 townspeople, plus all the Montreat employees. Thousands of people living or passing through the area and in spite of the odds, a brother finds a sister’s lost jacket when the two of them are almost 3,000 miles from home. Hey, call me lucky. If you send me a dollar, I will promise to buy the two of us a Washington State Lotto ticket. This is a BIG WHAT IF TALE. WHAT IF any of approximately 3,000 people in the Montreat area had picked up the jacket before I found it, I would not have recovered my sister’s coat. WHAT IF I had not left the Huckleberry 30 minutes after Peg’s departure, I would not have recovered my sister’s jacket. WHAT IF I had not taken the same route as Peg, I would not have recovered my sister’s jacket. WHAT IF I had not behaved as I have since age 12; always looking around for something suspicious, I might not have noticed the jacket. With any other brother, my sister may not have recovered her coat. WHAT IF I had not decided to transport the garment to the front desk, my sister might not have recovered her jacket. WHAT IF my sister had not been held up at the front desk by the verbose woman talking to the hotel clerk, which caused my sister to have to wait an inordinate amount of time for her turn to converse with the desk clerk? Had it not been for this development, my sister might have missed my grand entrance. If we had missed each other as I carried her jacket into the conference center, I would have handed it over to the hotel clerk for the lost and found. This story could have had a much different ending resulting in my sister never recovering her jacket. I find all the coincidences in this story to be remarkable which is why I felt compelled to write a Westside Story about it. In about 1957 when I was 14 years old, and Dwight Eisenhower was running for reelection as President of the United States, my pal Biff and I found some of the contents from the burglary and safecracking job at the ABC Amusement Company in Renton, Washington. We each were awarded a $20 reward and shared having our news and names in the paper with President Eisenhower. I have always had a proclivity for finding other people’s stuff. Why on this very trip, after finding Peg’s jacket, I found an iPhone on a table near the elevator at the Montreat Conference Center. I turned the iPhone into Lost and Found. Hmmm? I wonder if the iPhone belongs to Peg? There is no way for me to tell now because if I call her and it is her phone, it will just ring in Lost and Found. Timing is everything. More than once, I’ve found myself not able to get where I wanted in a timely manner, and being delayed following my route encountered a dramatic happenstance that I avoided by not being there at the moment of the incident. My reward is that my insurance carrier is happy with me. Now I realize that when I’m running late, I must be avoiding some negative event, and it leaves me wondering what it was. I love your positive view.